The folks at Houzz featured one of our client's kitchens in a labor day article (click through below). They came up with a to-do list for Labor Day weekend for all of you that are ready to get some projects done. Personally, I am going to be soaking up the sun since the warmer weather is on it's way out. But if you're in the mood to start some projects, check out their tips in the article below! And, if you want to check out more photos from this Goose Hollow home restoration, click below for the full gallery! The fact that air plants do not need to be potted makes them an easy & versatile addition to your home or office decor. There are so many creative styling options.. the opportunities are endless! Below are a few ways that we've styled air plants at JSS! Fiber wall hangings are the latest pieces to pop up everywhere. We love the texture and variety that fiber art can bring to a space. They're especially interesting when other materials are incorporated, like wood or ceramic tokens. Our buddy, Chris Dibble of Stockpiler, has some of the coolest wall hangings we've seen for sale on his site. Check out a few fiber wall hangings we love below. Our job is so much fun when we can vibe with our clients about artwork. Everyone has their own tastes, and it's important that our clients choose artwork that suits their home. But when we're totally on the same page about art picks with our clients, it makes everything so easy! One of our clients in Dunthorpe recently picked up an insanely cool Lars Hawkes block print while he was traveling. It had a bit of water and rust damage from improper storage as well as needing the top and bottom frames replaced. I have been screen printing consistently since college, but I hadn't used any of my restoration or conservation skills in a while. Ready to jump back in, I worked with a local fabric restoration specialist to re-hone my skills. After about fifteen hours of very detailed stripping, cleaning and applying a few different applications to the delicate print, I was able to almost fully restore the timeless piece. This process was time-consuming, but so rewarding. Take a look at the cleaned up piece below, and I'll try to dig up some photos of the piece pre-restoration as well. We are constantly looking for good fabric bags to throw swatches and samples into for clients. Rather than those bags being random shopping bags, we recently decided it was time to upgrade to something we could leave with clients that was our own. I have a screen-printing business in addition to my work with Jenna, so she asked me to get some bag samples and mock up some ideas for JSS branded bags. Check out the finished product! I also produce all of Jenna's business cards - they have more a textured, hand-made look than a traditionally printed business card. Screen printing is a great cost-effective way to print smaller batches of apparel, accessories and paper products. Reusable bags are a must have in Portland, as plastic bags were banned in the area a few years ago. What do you think? George the Schnauzer obviously loves them! Letter boards are popping everywhere. No longer relegated to the old diner or movie theater, they give us a bit of a feeling of nostalgia. They have come so far from simply being an efficient and organized way to display information. From expressing feelings, to celebrating occasions and making announcements, or just displaying a sassy thought, they are the item to have. The interchangeable letters make it a versatile piece to add to any room, party, photo, or event! Check out a few of our favorites below. Plants are a great addition to any space, but bathrooms can be a bit tricky. The combination of shower steam + lack of natural light isn't the type of condition you can just throw any ordinary house plant in. Here's a little list of our favorite plants that can not only survive in your bathroom, but are also nearly impossible to kill! Brass is being used in every way, shape & form for design and interiors lately and we love it! From door knobs to picture frames, brass is proving to be a versatile and well-liked material. Here are a few of our favorite creative brass forms! Wallpaper is a trend that was once lost, but is now making a strong comeback. We've been seeing so many bold prints, interesting graphics and fun colors used all over the house. Even one accent wall can add so much character to a room! 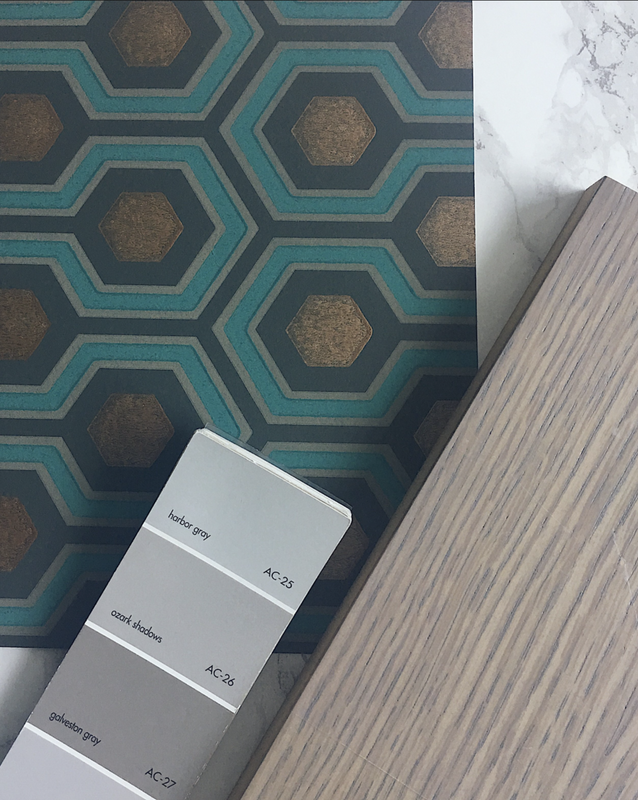 We recently went wallpaper shopping for one of our client's homes and these were a few of our favorites! Rejuvenation is our go-to for exterior finishes. From doorbells to drawer pulls, and house numbers to door hardware, Rejuvenation always surpasses our expectations in the variety and styles they offer. Their aesthetic can range from traditional to modern - their pieces are always timeless and classic. On this client's home, we were looking for elements that were minimal, but a bit unexpected. The house is a colonial, but we wanted it to look and feel like the family inside - fun and modern. Check out below for our sources! We also used Rodda Sharkskin paint in Soup to paint the exterior trim. Unique and interesting paint applications are a great way to add detail to a room. We love that this room has a pop of color painted to chair rail height. It's a nod to the traditional chair rail and allows for some fun, without feeling overwhelmed by color everywhere. If you want to recreate this look, we suggest Summer Sun Pink from Benjamin Moore. If you love the clock, you can find it at one of our favorite retailers, DWR. Summer is right around the corner, which means lots of outdoor hangs! Whether you have an expansive backyard or just a tiny apartment balcony, your outdoor space should be a place you can relax, enjoy and entertain! Jenna popped into the West Elm Flagship store in DUMBO, Brooklyn on her recent trip to NYC and got a sneak peak of some of the pieces before they launched. Here are a few of our current favorites from West Elm's summer lineup. Here at JSS, Stockpiler is one of our absolute favorite places to find unique goods for our client's homes. We feel as though it's extremely important to support artists and makers in any capacity, from helping our client's to find their pieces, to spreading the word about their incredible work. A few weeks ago, we sat down with Chris Dibble of Stockpiler to hear about his latest pop-up event, The Modern Craft of Fiber Art at Kat+Maouche, opening on Thursday night. CD: It's a community connector, a traveling showcase of curated work from artists and makers. JS: Where did the idea for Stockpiler come from? CD: I was planning a move from LA to Portland a few years ago, and everyone kept telling me how much Portlanders and Oregonians hated Californians. When I finally moved here, I didn't experience that at all - everyone was welcoming and lovely. There was this amazing, natural sense of community, especially at these artist and maker shows that I would attend. I loved what I saw, and it got me thinking about it got me thinking about the idea of introducing new work to the community. I had all of these ties to makers and artists in LA, and I wanted to bring their work up to Portland and vice versa. It was a way to not just sell their work, but rather introduce them to new venues that might want to sell their pieces. I saw it as a potential opportunity to create new wholesale accounts for these artists. It's incredibly difficult as a maker to make a living, so this is my way of being a patron and helping to fund these artists since I can't afford to buy all of the pieces that I fall in love with. I love community and the relationship that it has with each of us - it's incredibly important to cultivate it, particularly in today's day and age when it is so easy to feel disconnected from your local communities. I want to bring people a real sense of connection. I myself can get really caught up in Instagram and my phone, so I work really hard to have face time, particularly with artists, to help grow a community. JS: What are the parameters for a maker to join Stockpiler? CD: Originally it was just geographic - I would sell pieces from LA makers in Portland and pieces from PDX in Los Angeles. The pieces were from people that I had relationships with because I had met with them and then responded to their work and was drawn into a friendship. I felt like if I had a strong feeling towards their work, then others might too. My particular curation style is unique because I think I am drawn to pieces that maybe a lot of folks might not understand. It's not about 100% audience approval, but about finding a handful of people that respond to the works. It's all very intuitive, I see something that I am drawn to and then a natural relationship develops. But Stockpiler is now growing out of its geographical parameters - my makers live all over Oregon and California as well as Colorado. It takes a little bit more time because I don't have direct connections with artists in other locations, but I'm using Instagram to connect with artists from all over. I tend to be drawn to more functional art, but all mediums are welcome. Originally, I focused entirely on fiber arts and ceramics, because they're what I knew, but as Stockpiler grows, we're looking for new mediums. I would like to curate photography and works on paper as we expand. Ultimately, our goal is to peak the client's interest in an artist, whether they buy that piece on the wall or not, maybe they'll explore the artist's work themselves. JS: How did the relationship with Kat+Maouche begin? CD: Stockpiler is focused on presenting artist's pieces in a retail setting rather than a fine art gallery setting. I feel that it's inviting to the client, rather than intimidating. A retail environment allows for a lot more fun. So, I originally saw Kat+Maouche's rugs at Sunday Emporium. They caught my eye and I wanted to know everything about the owners and what they were doing. The textiles are what drew me in, but I started talking to Katen about the history of Beni Ourain carpets and it gave me a deeper understanding and appreciation because I learned about the history. They weren't just aesthetically pleasing, they had a story. I would stop by their shop randomly because I was interested in what they were doing, bringing incredible vintage rugs straight from Morocco, and we started to develop a relationship. In the new year, I decided to take Stockpiler in a new direction, and I wanted to have a fiber focus, so Kat+Maouche is really the perfect place for the show. I wanted it to be in their shop because I think the show will be really well responded to in the context of their own fiber arts. The owners, Latif Bezzir and Katen Bush, have been so amazing to work with. I worked with Katen on figuring out the name of the show because I didn't want it to be too serious, but I also didn't want it to be too cutesy. I want to keep things straight-forward and transparent and realistic and inclusive. JS: I think you are bringing art to the masses in your own way. CD: I've worked in tons of high-end fine art galleries and craft fairs too, and I wanted to find a balance between fine art and something that's more crafty. JS: It sounds like it's really about bringing art to more people in a different way. Make sure to stop by Kat+Maouche (23 NW 4th Ave in Portland) on Thursday between 6 and 9 for the opening party or stop by Kat+Maouche during business hours to check out the installation. The Wishbone Chair, also sometimes referred to as the "Y" or "CH-24," By Hans Wegner (available at Design Within Reach), is the perfect chair for a stylized and sophisticated look in almost any space. This chair, hand woven and steam bent, has been in production since 1950 and is available in beech, oak, ash, cherry and walnut or painted with a cord choice of natural woven and black. Check out a couple of my favorite photos of the Wishbone chair below! Neon is the latest trend to hit the decor world. Fun and pop-arty, the neon trend actually started in the art world. You may have seen the neon art in the like's of Kourtney Kardashian's daughter Penelope's bedroom or at Art Basel, but neon has officially reached the masses. We love the whimsical feeling of a bit of neon. You can get true neon and faux neon just about anywhere these days - Nordstrom, Gilt, Target & even Urban Outfitters. Or, go truly original and look for a local source to make something custom. Fresh herbs are an essential part of any garden. But did you know, fresh herbs are a fabulous item to add to your dining table? Leave out pairs of scissors and allow your dinner party guests to add fresh flavors right to their dish. Fresh herbs are especially essential when you're serving Italian. We've shown ours in Base Modern's Moon Phase Bowls. They're gorgeous enough for a tabletop setting & have holes in the bottom for drainage when your herbs need a bit of agua. You can purchase Base Modern's Moon Phase Bowls in the JSS shop - just click the shop link at the top right of the page! We've been working on the ins and outs of this home for a little under a year now. Check out the changes we've made to the front of the house so far! Check out the inspiration & shopping board that we put together for a client's rental property renovation. For this client, they just wanted an inspiration board so that they could work with their contractor to quickly renovate and re-rent the property. Check out this navy blue bar that we recently completed for a client. Our friends at Base Modern helped us to design a gorgeous blackened steel frame for our client's whiskey collection. We completed it with a Kohler faucet & sink and Carrara marble counter. Construction is just about finished on our master bathroom project in Lake Oswego, and we're super pumped to get the space styled and shot! Want a fun and easy way to modernize a bathroom? Try copper! This material is a fresh, modern way to spruce up any old bathroom. Pulls on cabinetry can really make or break the look and functionality of a space. We love to use integrated pulls that tie into the modern aesthetic of the surrounding architectural elements that occupy the room. We're using integrated pulls in a current master bathroom project and can't wait to share photos with you guys when it's done!